CLEVELAND, Ohio -- LeBron James and the Miami Heat begin their NBA Finals series tonight against the Thunder in Oklahoma City. It's the third championship series for James. He and Miami were defeated, four games to two, last season by the Dirk Nowitzki-led Dallas Mavericks. James was heavily criticized for his overall performance, especially for his disappearing act during the late moments in several games. James infamously left the Cleveland Cavaliers as a free agent in July, 2010. Akron-native James had led the 2006-07 Cavaliers to the lone Finals appearance in franchise history. The Cavs, in order, won playoff series over the Washington Wizards (4-0), New Jersey Nets (4-2) and then, the Detroit Pistons (4-2) in the Eastern Conference Finals. James, generally, played brilliant basketball during the Cavaliers' drive to their first Eastern Conference championship. Most memorable was his 48-point effort -- including 25 straight Cavs' points during a stretch of the fourth quarter and overtime -- that keyed Cleveland's 109-107 double overtime win in Game 5 at Detroit. 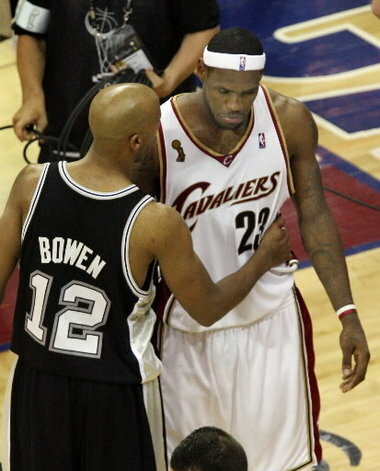 The Cavs then met the Western Conference champion San Antonio Spurs for the NBA title. Gregg Popovich had coached San Antonio to championships in 1999, 2003 and 2005. The Spurs featured Tim Duncan, who had played on all three title teams and is considered by some as the greatest power forward in NBA history; dynamic shooting guard Manu Ginobili, slick point guard Tony Parker and defense-oriented small forward Bruce Bowen, each of whom had played on two of the Spurs' championship teams.